Inder Loves Folk Art: Heat wave. The kids have been coping pretty well. I think Joe has the right approach: strip down to your skivvies and then hang out on the cool hardwood floor. Nothing slows Maggie down. Steve calls her "Turbo." I call her "my little mountain goat." She is a climber. Climb, climb, climb, all day long. Saturday it was just too hot to sew. I took the kids to the ocean. It was breezy and beautiful. Perfect. Joe loved playing in the water. Joe was literally dragging me into the surf (and the surf was no joke - this is the Pacific ocean!). He got pummeled a few times, but just went right back for more! My children: They have no fear! Are other kids like this? Between the crazy climber and the kid who dives into the Pacific even though he can't swim ... I can just feel my hair going gray. Sunday was a few degrees cooler and I wanted to sew! I wasn't feeling up to a major undertaking - I wanted something fast, easy, and good for hot weather. 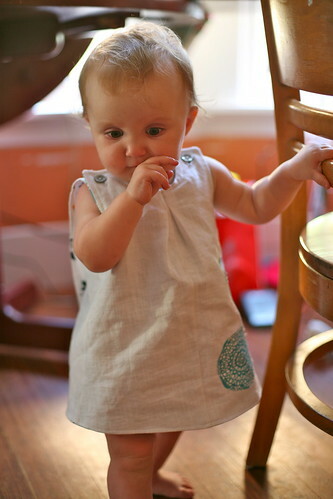 Well, obviously: another Roly Poly Pinafore Dress for Maggie. So I decided to use some white linen that was once part of a strange outfit that I pulled out of a trash pile in my Oakland neighborhood. Yep, you heard that right - I pulled this fabric out of the trash. I was coming back from having breakfast with a friend, when I saw some white fabric sticking out of a a bag next to a dumpster. I would not have given it a second look, except it looked like white linen. Given that this is Oakland, and I don't live in the nicest neighborhood, I pulled it out very cautiously, using only the tips of my finger, at first, because I was worried about ... um, hazardous waste. But no! All I could see was a pristinely clean, if somewhat unique, white linen top and pants. And an eyelet top. So I grabbed the pile and ran! Here is a cell phone photo I took after running everything through the wash on "super hot" (sorry for the low quality photo). The eyelet top has black sequin trim (??!) 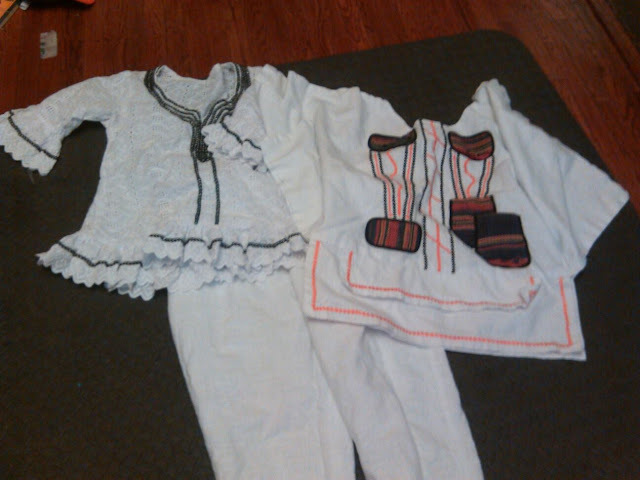 and the white linen outfit is decorated with machine embroidery and, um, pockets made from um, baskets (!!?). The overall effect is ... interesting. But hey! Nice linen! Anyway! 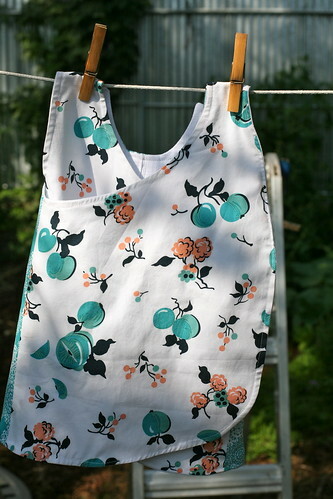 I decided to go fully reversible this time, using the white linen on one side, and two pretty prints on the other side. The white side is pretty plain, so I appliqued some doilies on it (ETA: These are not doilies! They are snowflakes!). This time I took the time to stitch down the little inverted neck pleat (last time I was lazy and skipped it). Such a cute little detail. The other side is lace doilies. And a pretty retro fruit print I've had in my stash for years now (remember, I'm still on a fabric diet!). The best part is that it fits! This is the 6-month size, and it's perfect on Miss Margaret. This is Maggie. She loves to climb, climb, climb. 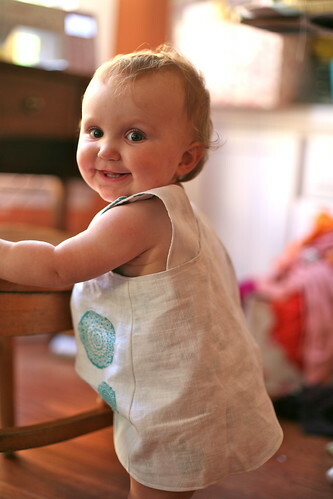 Maggie thinks, "Maybe, if I flash Mama a big smile, she won't notice that I'm about to try to climb this chair?" "So far so good ..."
"Oh no! 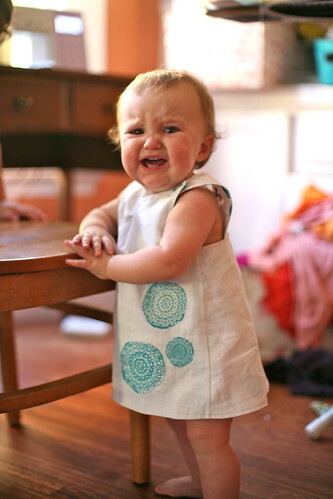 Mama put down her camera, pulled me off the chair, and told me 'No climbing chairs!'" "Mama, you won't let me do anything fun!" Five minutes after this photo shoot, Maggie upended Steve's beer on herself. So into the wash the new dress went! 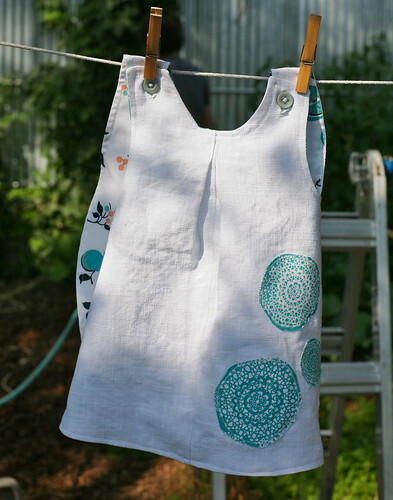 The great thing about dumpster dived linen - you know it can be washed on super hot! wow, girl, you are on a ROLL! this is awesome! what a find! and i LOVE what you did with it. how inspired! iris is also a climber! she can now climb our gate to get to our stairs. 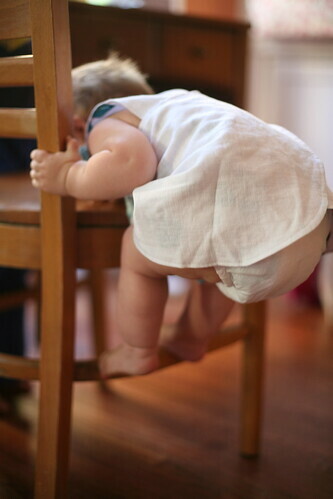 she can also climb out of her crib. dan built it up higher, but she climbed over that, too! he stands next to her and rubs her back when she goes to sleep. he has to wait until she is totally asleep to leave, otherwise she might climb out and hurt herself (and she is way too young for a toddler bed, in my opinion). she still sleeps in our room, so once we go to bed, we hear her when she wakes up. the climbing is tough stuff! That is one heck of a trash to treasure story! I feel you on this heat, I think a trip to the beach is in our future although I've got a wave jumper too. Not exactly relaxing but generally fun! I've noticed with the no fear comes toughness, Jude only cries if he is seriously hurt (or doesn't get his way) which is nice. Lol, I love your posts! 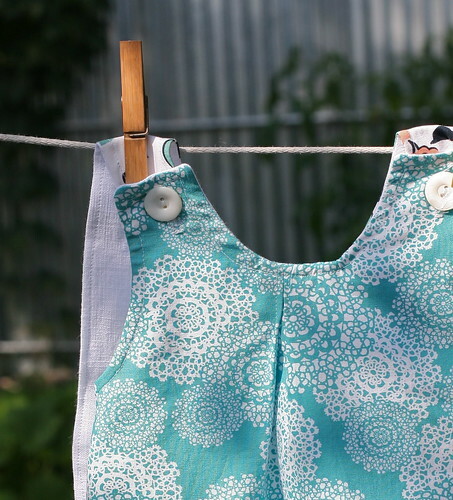 And love this pinafore - fab fabric combo, rubbish pile be damned! My kids are like that too as you know. Plans for the broderie anglaise yet? I assume not pants for Joe. It is perfect for this weather though. love it SO much! i can't believe how big she is already! and yeah... i've had some good trash treasures in my time :) always excellent! Such a cool story! Love the dress, off to investigate. My Isla is number four and at 4 months just loves to feed, feed, feed. But i know the climbing days are not far off, my number three Wyn, who is twenty months, keeps me in my toes with that, especially when i am sitting down to do yet another feed, feed, feed! That fabric is Kaufman Brrr too, lovely with the linen! Oh this is adorable! And wow...from trash to treasure for real, right!? Beautiful! She's getting to be so big! I love old clothes for fabric! Especially linen! Super cute.